Participants Agreement and Inventory sheets will be collected on Thursday, April 4, 2019. Be sure to make a copy for yourself. FQG accepts no responsibility for any items lost, stolen or damaged. Items are not covered by any insurance. Every year there are stolen, lost or unaccounted for items. This has not been a significant problem, but the possibility exists. All sale items must be dropped off between 9am and 11am at the church building, 3885 Richardson Drive along with your signed participation form. NO EXCEPTIONS! Submission of items for sale indicates acceptance of the guidelines. You must check in with the inventory control person. She will verify your participation by checking the work schedule. Please leave at least one cardboard or tote box with your name and member number clearly marked; we will use these at teardown for un-sold items. You may leave other boxes stowed under the tables, as long as you have your name on them, but we are not responsible for them. Please report 10 minutes before the start of your shift. Wear your name tag. Hours: Thursday, 5-7pm - members only! Pick-up: Saturday, April 6, 2019 between the hours of 4:30pm – 5:30pm. No collection or sorting of goods will take place until all shoppers have exited the building. Unsold items must be picked up between 4:30pm and 5:30pm. If someone else is collecting your things, please let us know when you sign in. It is your responsibility to pick up your unsold items. This is not the job of the volunteer workers! When you pick up your items please check the lost tag area for items and tags that became separated. At our Country Store you name the price -- you keep 75% and the Guild takes 25% for commission. Reminder: we have done away with the half off sale. Member numbers are located in the membership directory. The inventory number corresponds to your inventory sheet. The sales price includes the Guild’s 25% commission. Securely attach the upper section of the price tag to the sale item. Secure with 2” wide packing tape, a minimum of 2 staples per item or a safety pin -- whatever it takes to keep it on! If you staple tags to fabric, though, do it in the selvage so you don’t create holes in the fabric. Price tags that can be easily removed can be easily lost! NO TAG = NO SALE! Price tags on books or magazines go inside the front cover. If multiple magazines are grouped, put them in a clear plastic bag or tie them together securely. Use staples for price tags. The bottom section of the price tag gets cut off at the time of sale and is our inventory control tag. ● Make scrap gallon bags of fabric instead of many small sandwich size bags -- they sell! Fillable pdf files may not be able to be saved. If you want to start pricing and inventorying items throughout the year, you can use the regular pdf files and fill in by hand; or the Word document and save it on your computer. The Word document has been formatted as a table so you don’t have to worry about lines. These forms have BIGGER PRINT – easier for everyone. 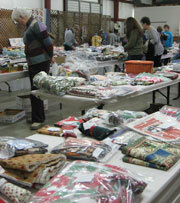 Nearly everyone who attends the quilt show comes through the Country Store. Guild members may sell anything related to quilting, sewing, or fabric/fiber art: notions, patterns, books, quilts or whatever you’d like to clear from your stash, even UFOs. Your rejects can become someone else’s treasure. 2019 Country Store Guidelines All participants are required to work a 2-3 hour store shift. Your items will not be accepted unless you have signed up for a shift. See schedule person during regular meetings to sign-up. Sale items must be the property of the seller and should be in condition befitting the reputation of the Guild. Checks for items sold will be issued after a financial statement has been prepared. Participants may pick up their check at the May Guild meeting. If not in attendance, checks will be mailed in a timely manner. Call us if you have any questions...we're looking forward to another successful year! FQG receives a 25% commission on all items, so price accordingly. The Guild collects sales tax.